Aim : To evaluate and compare the correlation between sagittal condylar guidance obtained by protrusive interocclusal records mounted on semi-adjustable articulator with panoramic and Lateral cephalogram radiograph tracings in dentulous population. Materials and Methods: One-hundred twenty dentulous subjects between age group of 20-40 years, free of signs and symptoms of any temporomandibular diseases were selected. The sagittal condylar guidance was determined by protrusive interocclusal records and transferred to a semi-adjustable articulator through a face bow. The condylar guidance angles obtained were tabulated. The sagittal outline of the articular eminence and glenoid fossa were traced on panoramic and lateral cephalogram radiographs. The sagittal condylar path inclination was constructed. This was related to the Frankfurt's horizontal plane on radiograph to determine the radiographic angle of sagittal condylar guidance. The comparison of protrusive interocclusal records was done with the angles obtained by panoramic and lateral cephalogram radiograph tracings. Results: The mean difference between the condylar guidance values obtained using panoramic and lateral cephalogram radiographs was 0.13° and 0.67° on right side and 1.0° and 1.54° on left side with the radiographic values being higher. A Significant positive correlation was observed with P values 0.001 and 0.005 in left and right respectively. Conclusion: This study highlighted on the correlation between protrusive interocclusal records and the lateral cephalogram radiograph tracings which were more positively related than the panoramic radiograph. The values of lateral cephalogram radiograph tracings are closer as separate radiographs for left and right side were taken, causing the amount and quality of image distortion less. Lateral cephalogram radiograph may be taken as an important tool to rely on for recording the Sagittal condylar guidance angle. The goal of a prosthodontic rehabilitation is to fabricate a prosthesis which is in harmony with the patient's stomatognathic system. The most essential consideration in the oral rehabilitation of any patient is the inclination of the condylar path. Success of complex prosthodontic procedures is enhanced by accurate simulation of the condylar path of the patient on an articulator. It enables the clinician to estimate the correlation between the path traced by the condyle during mandibular movements and the morphology of the occlusal surfaces which in turn aids in restoring the occlusion without interferences. Condylar guidance by definition (GPT-8) is the mandibular guidance generated by the condyle and articular disc traversing the contour of the glenoid fossa. Condylar path is a path traversed by the condyle in relation to the articular eminence when the mandible is moved either protrusively or laterally from centric relation. If condylar guidance is not recorded accurately, it will lead to occlusal interferences during mandibular movements. This may also increase chairside denture adjustment time, which can be frustrating for both the patient and the dentist. The protrusive jaw relation is important to record and to set the condylar elements of the articulator so that they will reproduce inclinations, which are similar or comparable to that of the patient's temporomandibular articulation. Various intraoral and extraoral methods have been used to register the path of condyle and adjust the condyle accordingly. Extraoral methods are generally exemplified and are mainly used in edentulous patients. , Interocclusal protrusive wax records, Lucia jig, leaf gauge, and intraoral tracers are the most commonly used intraoral methods. However, many rely on average values of condylar guidance, which range from 22° to 65°. ,, Centric and eccentric relations of the mandible can be recorded through intraoral or positional wax method. Despite accurate registration methods, sources of error arise in laboratory procedures as a result of instability of materials and changes during their setting or polymerization. Moreover, if the patient moves the jaw laterally in the protrusive movement, the registration of the condyle will be changed. Literature indicates the use of lateral cephalogram, pantomographs, and tomography for recording condylar guidance. Studies have shown that radiographic methods can record condylar guidance more accurately. ,,, In addition, there is little evidence in literature to suggest radiographic method in comparison with other methods, mainly using lateral cephalogram radiographs. Recently, digital computed tomography scans have made them safer, more accurate and comparatively cheaper resulting in their widespread application in many areas of dentistry. It can be argued that application of advanced imaging is unwarranted in prosthodontics. Yet, the higher levels of safety, accuracy, and ultimate patient benefit from advanced digital imaging suggest that time may be ripe for its introduction into prosthodontics. The use of supplementary aids such as imaging may help in resolving the above problems and establish accurate registration of sagittal condylar guidance. The outline of the articular eminence and the glenoid fossa of the temporal bone have been evaluated on panoramic radiographs and also on the lateral cephalometric radiographs and are of valuable aid in setting the condylar guidance in semi-adjustable articulators. This study is sought to evaluate the two radiographs for recording and determining sagittal condylar guidance and to correlate with the protrusive interocclusal records by the patient. A total of 120 dentulous subjects participated in the study after written informed consent was obtained. The study was given clearance by the Institutional Ethical Review Committee and was completed over a period of 3 months after collection of records. Subjects within the age group of 20-40 years having at least three teeth in each posterior quadrants were included while subjects with less than three teeth in each of the posterior quadrant, facial or skeletal malformations, temporomandibular disorders, and poor neuromuscular co-ordination were excluded from the study. Maxillary and mandibular impressions were made using irreversible hydrocolloid (Algitex 2012; DPI, India) impression material, disinfected, and casts were made using Type III dental stone (Dental Stone, Kalabhai, India). Each patient was instructed to move his/her mandible forward by approximately 6 mm and/or edge to edge contact in anterior using Aluwax, and a protrusive record was obtained [Figure 1]. 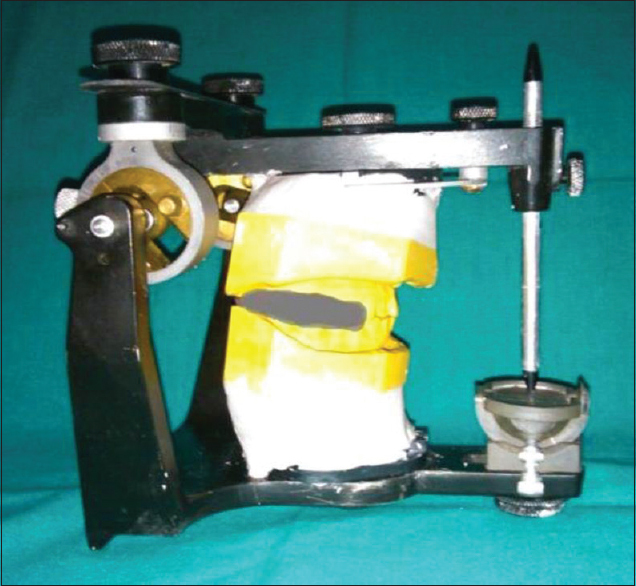 Using face-bow transfer, the maxillary cast was mounted on the semi-adjustable articulator (HANAU TM Wide-Vue, Whip Mix Corporation, USA) and the mandibular cast was mounted using the patient's maximum intercuspation record [Figure 2]. The condylar guidance angles recorded on the articulator were tabulated. Panoramic radiographs [Figure 3] and right and left lateral cephalogram radiographs [Figure 4] of last 6 months were obtained from the Department of Oral Medicine and Radiology. These radiographs are made for the patients' who have visited for different treatment like Single tooth Implant in any of the posterior quadrant or for surgical removal of impacted teeth. The radiograph of each patient was made with personal protection barrier with the Frankfurt horizontal plane parallel to the floor of the mouth. All radiographs were made by the same panoramic radiographic unit. The images were acquired at 74 kVp and 10 mA. 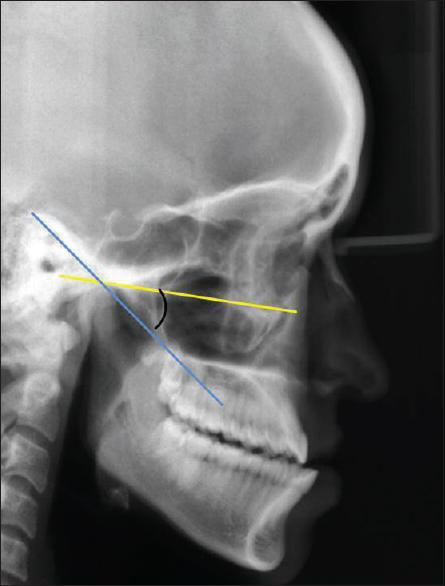 Two radio-opaque lines are consistently apparent on the radiographs in the region of the temporal bone. One depicts the outline of the articular eminence and fossa, the second, the inferior border of the zygomatic arch. Tracings of the radiographic images were made on a transparent sheet. A horizontal reference line was marked by joining the orbitale and porion. The most superior and the most inferior points of the curvatures were identified. These two lines were connected by a straight line representing the mean curvature line. Condylar Guidance angles made by the intersection of the mean curvature line and the horizontal reference line traced were measured [Figure 5]. The results obtained were subjected to statistical analysis in SPSS 16 software (Statistical Package for the Social Sciences, IBM Software Group, USA). The Paired t-test was applied for intergroup analysis. Spearman's-Rho test was used to find the correlation between the sagittal condylar guidance between two radiographic methods on both sides and also between left and right sides. Further, Wilcoxon signed rank test was applied to check the significance between the right and left condylar guidance determined by two radiographic methods. A total of 120 dentulous subjects participated in the study. [Table 1] and [Table 2] summarize left whereas [Table 3] and [Table 4] summarize right mean and standard deviation of condylar guidance values. The angles of the condylar guidance and standard deviations were measured by the protrusive interocclusal record and with panoramic and lateral cephalogram radiographic methods. The correlation between the condylar guidance angles measured by protrusive interocclusal record and panoramic radiographic image were compared with condylar guidance angles measured by protrusive interocclusal record and lateral cephalometric radiographs on both right and left separately [Graph 1]. The mean differences between the condylar guidance values obtained using both methods were 0.13° and 0.67° on right side and 1.0° and 1.54° on left side with the radiographic values being higher. Significant positive correlation existed between the inter-group comparison with condylar guidance values of right and left sides in same subjects obtained using the protrusive interocclusal registration (PIR) and also by the panoramic and lateral cephalogram radiograph separately. 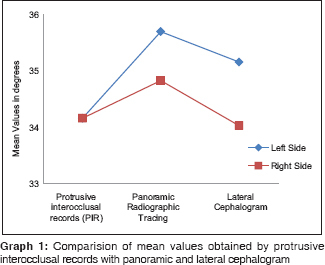 The values obtained by the lateral cephalogram radiograph were closer to the values obtained by protrusive interocclusal records than panoramic radiograph in both left and right Side. A significant positive correlation was further observed with P values obtained by Wilcoxon signed rank test were 0.003 and 0.005 in left and right side, respectively with left side being highly significant. Hence, the present study utilized Hanau springbow which relies on the Frankfurt's Horizontal plane to transfer the patients' relation to the articulator. The same plane is readily demonstrable on a panoramic and cephalometric radiograph by joining the porion and the orbitale landmarks [Figure 5]. The panoramic and lateral cephalogram radiographic image of the sagittal outline of the articular eminence and glenoid fossae was clearly identified in all the 120 subjects. Inter-examiner reliability in identification of the radiographic outline of the articular eminence and determination of condylar guidance by the radiographic method showed suitable mean value difference of 0.13° and 0.67° on the right side and 1.0° and 1.54° on the left side. The average condylar guidance by the interocclusal method was 34.16° on both right and left side. The mean condylar guidance values obtained using the panoramic radiographic method was 34.83° on the right side and 35.7° on the left side. Whereas condylar guidance values obtained using the lateral cephalogram radiographic method was 34.03° on the right side and 35.16° on the left side. Literature suggests that the right and left eminences seldom have exactly the same slants, contours, and declivities. Similarly, the present study showed a lesser mean difference between the right and left sides by the protrusive interocclusal record method than the panoramic radiograph and lateral cephalogram method, highlighting the inherent differences in the method of determination of condylar guidance. A significant positive correlation was observed between the condylar guidance acquired using protrusive interocclusal records and panoramic images for both right and left sides was P = 0.005. Further more significant positive correlation was observed between the condylar guidance acquired using protrusive interocclusal records and lateral cephalogram images for right and left side P = 0.003. A study comparing the radiographic image of the sagittal condylar path inclination and its actual anatomic outline in dry skulls found that the radiographic values were on an average 7° greater than the skull values. The present study found that the condylar guidance values by both the radiographic method were greater than the protrusive interocclusal method for the right and left sides. Digital lateral cephalogram was selected in this study to obtain individual sagittal condylar guidance value which was taken as a standard for critical comparison with two groups. According to Davis and Mackay,  digital imaging with interactive computer processing have added benefits of high-quality images, speed of application, low radiation dosage, direct analysis and as accurate as manual technique. Lateral cephalogram reveals accurate morphology of the articular eminence and anatomic landmarks to draw reference planes, i.e. Frankfort horizontal plane in single image. The exposure time for lateral cephalogram radiograph is 6-7 times less than that of the panoramic radiograph. Though overlapping of right and left side of structures can occur due to improper patient positioning, it can be easily made out on a film because of difference in resolution. The correlation between mean sagittal condylar readings of the articulator and cephalogram readings could be possibly due to the anatomic representation of the articulator design in close approximation with the human TMJ. However, a slight difference in values of both these groups could be justified by the active role played by the articular disc, ligaments, and muscles in condylar movements and neuromuscular synchronization during functional mandibular movements. Lateral cephalogram radiograph is better than panoramic radiograph in determining the sagittal condylar guidance in the patient. Although direct comparisons between a functional method and a radiographic method would seem improbable; the present study found a strong degree of correlation between the condylar guidance determined by the two radiographic methods. Considering the limitations of the articulator and the operator during the interocclusal record technique with inherent errors; the radiographic method may have clinical relevance. Further, there is a positive correlation of radiographs with the protrusive interocclusal records. As reported in previous studies, values obtained by Protrusive interocclusal records are close to panoramic radiographs. This study highlighted on the correlation between protrusive interocclusal records and the lateral cephalogram radiograph tracings which were more positively related than the panoramic radiograph. The values of lateral cephalogram radiograph tracings are closer to the interocclusal records on the articulator as separate radiographs for left and right side were taken, making the amount and quality of image distortion less. Lateral cephalogram radiograph may be taken as a reliable important tool for recording the Sagittal condylar Guidance angle, and this study may be conducted in future with more number of subjects for better correlation of PIR obtained clinically with the radiographic methods. Pelletier LB, Campbell SD. Comparison of condylar control settings using three methods: A bench study. J Prosthet Dent 1991;66:193-200. Hickey JC, Zarb GA, Bolender CL. Boucher's Prosthodontic Treatment for Edentulous Patients. 9 th ed. St. Louis: CV Mosby; 1985. p. 415. Tannamala PK, Pulagam M, Pottem SR, Swapna B. Condylar guidance: Correlation between protrusive interocclusal record and panoramic radiographic image: A pilot study. J Prosthodont 2012;21:181-4.
dos Santos Júnior J, Nelson SJ, Nummikoski P. Geometric analysis of occlusal plane orientation using simulated ear-rod facebow transfer. J Prosthodont 1996;5:172-81. Prasad KD, Shah N, Hegde C. A clinico-radiographic analysis of sagittal condylar guidance determined by protrusive interocclusal registration and panoramic radiographic images in humans. Contemp Clin Dent 2012;3:383-7. Harcourt JK. Accuracy in registration and transfer of prosthetic records. Aust Dent J 1974;19:182-90.
dos Santos J Jr., Nelson S, Nowlin T. Comparison of condylar guidance setting obtained from a wax record versus an extraoral tracing: A pilot study. J Prosthet Dent 2003;89:54-9. Thakur M, Jain V, Parkash H, Kumar P. A comparative evaluation of static and functional methods for recording centric relation and condylar guidance: A clinical study. J Indian Prosthodont Soc 2012;12:175-81. Boos RH. Condylar path by roentgenograph. J Prosthet Dent 1951;1:387-92. Prajapati P, Sethuraman R, Naveen YG, Patel J. A clinical study of the variation in horizontal condylar guidance obtained by using three anterior points of reference and two different articulator systems. Contemp Clin Dent 2013;4:162-9.